Outdoor thermometers alert homeowners to weather conditions. The thermometers help owners decide if what to wear before leaving the house. However, the sensors in outdoor thermometers are sensitive to sunlight and have inaccurate readings when in contact with sunlight directly. Protecting the outdoor thermometer from direct sunlight is the easiest way in ensure accurate readings. 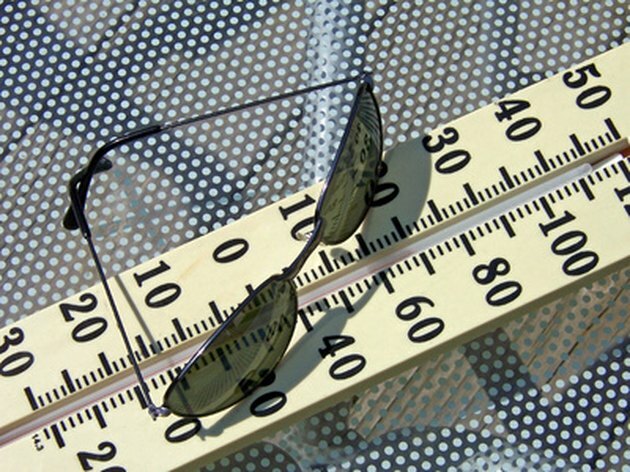 Protecting an outdoor thermometer from direct sunlight is necessary to get accurate readings. Position the thermometer on the north or south side of the building. The sun rises in the east and sets in the west so north side placement can prevent direct sunshine exposure. Post the sensor several feet off the ground. Direct sunlight can hit the ground underneath the sensor and the heat waves can raise up and give a false reading to the thermometer. Keeping the sensor elevated can help diffuse the extra heat and result in a more accurate reading. Position the thermometer under a small awning. Hang a small awning above the thermometer to block overhead sunlight without blocking the thermometer's visibility. Keep the thermometer in a housing with vents that can block direct sunlight without allowing heat to build up internally. This method will keep the thermometer sensor shaded and will provide a better measurement. What Is a High-Voltage Indicator? Why Does the House Alarm System Keep Beeping?